I've been really bad about blogging for the past few years. I think it's mostly because I sometimes feel like I'm repeating what I've already posted on Instagram. Or I feel like no one is going to read this, so what's the point. I think in general, there's been an overall decrease in readership for personal blogs. But I've come to realize that I mostly blog for myself. It's nice if there's someone out there reading this, but I like the habit of blogging. This week is the first week in a long while where I get to paint whatever I want. The first half of April was spent painting some dog commissions, and the rest of it was spent sewing a large wholesale order. I had so much painting withdrawals! I've made it a habit to try to paint every day or every other day. When I go more than 3 days without painting a single thing, I go a little crazy. It's not so much that I'm a workaholic. It's more that any time I spend painting is time spent investing in my future and developing muscle memory. 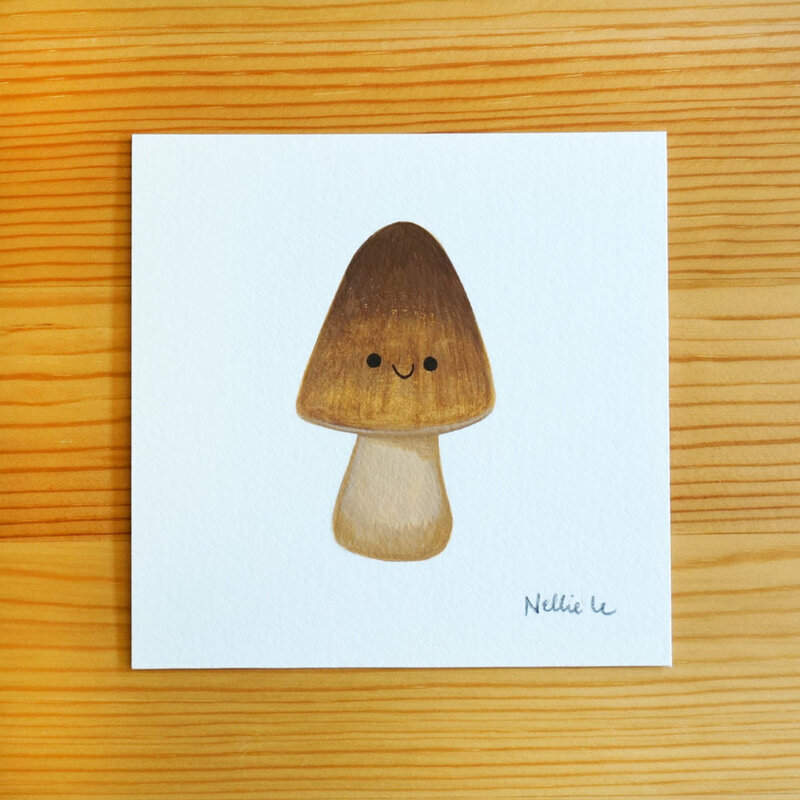 So today, I decide to paint some things I've never painted before: Mushrooms. A lot of my art practice is really just painting things I've never painted before. I like to paint things that are not just different forms, but things that have different surface textures. What I learn from doing these quick studies comes in handy later one when I'm tackling a painting for a gallery exhibition or new paintings for prints. I often just look up images on Google for reference, but some simplifying of the form happens so that it still looks like it's in my style. Below is a Straw Mushroom and a Portobello Mushroom. Both of these dudes are available in the shop!